Why are Ugandan teachers so often skipping school? Natlalie Aldham writes for Hynd’s Blog about the importance of tackling the underlying causes of the ‘truant teachers’ in Uganda before blaming them for skipping school. Natalie is a teacher in the UK who volunteered in Uganda in 2013. Having spent a number of months last year working in Kampala primary schools, and having several colleagues around Uganda doing the same, I have a fair understanding of the problems teachers in Uganda face. The headline then in the Guardian, Uganda’s truant teachers targeted by pupil text-messaging scheme, caught my eye and made me a little cross. Although the article touched on some of the root causes of why teachers might be absent from schools, the overwhelming message was ‘blame the teachers’. The general gist of the article is that teachers in Uganda regularly do not show up for work, which has an obvious knock-on effect on children’s education. The solution? 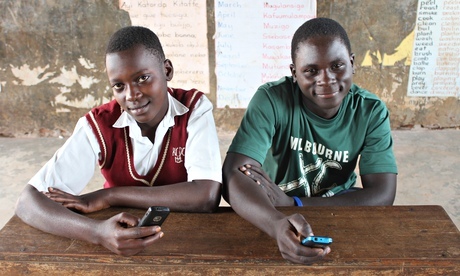 Give the children mobile phones so that they can text and ‘tell on’ their teachers. I like the idea of giving pupil’s agency to hold their teachers to account and I am heartened to learn that this system makes Nabwire and his classmates feel less afraid of their teachers. But this whole scheme ignores the old adage that ‘prevention is better than a cure’. We have to ask, why are teachers absent from schools to begin with? I love my job and it gives me a sense of purpose. I feel a sense of responsibility towards the children I teach, I care about their wellbeing, and I get a buzz from watching them learn and grow. I get paid which means I can pay my rent, buy food, pay bills and afford many luxuries. So why don’t Ugandan teachers feel the same? Firstly, many are under trained. Teaching in Uganda isn’t always a profession you go into because you love working with children and believe it will be fulfilling. You go into it because you did well enough to finish school but not well enough to go on to University. You make this decision aged 17 and are stuck with it. Some Ugandan teachers are highly motivated, good at their job and enjoy their work. They are the lucky ones. Many don’t. If your training has been fairly basic and you have 100+ children to teach in a room with potentially no furniture (the resource filled classroom described at the beginning of the Guardian article is a rarity) then motivation to go to work can easily be outweighed by motivation to do pretty much anything else. Unfurnished and dirty classrooms, where children lack even the basic resources such as pencils and paper make teaching difficult. Without good training teachers rely on (often corporal) punishment to ensure ‘good behaviour’. Many children haven’t eaten breakfast before school and a lot don’t get lunch either; hungry children aren’t the best learners. Training in how to teach children with Special Educational Needs is minimal at best, which presents further problems for teachers. The curriculum and assessment methods leave a lot to be desired. ‘The report attributed teacher absenteeism to factors such as illness, attendance of funerals, poor school infrastructure, transport problems, environmental conditions, lack of lunch available at school and even drunkenness. These factors listed might sounds trivial, but they are real issues which teachers worry about and they shouldn’t be listed in this off-hand way as though they are just excuses. Take the example of ‘attendance of funerals’. A school I heard of recently in Western Uganda has lost two of its teachers to premature deaths in the last year. My friend arrived to observe lessons at the school only to find hundreds of children sitting quietly with nothing to do while their teachers were at the funeral. Death among younger adults is almost an everyday event in Uganda and people really are often required to attend funerals when they ‘ought’ to be at work. I could go on to give anecdotes about hauling water from the bore hole because the water board and local council can’t settle their differences and get the piped supply turned back on; over-the-odds numbers of serious road traffic accidents which leave teachers or their relatives in hospital (hospitals where you must visit and help any patients you know because otherwise they won’t necessarily be given any food); and I’d have a field day if I started on ‘poor school infrastructure’. Suffice to say, the factors listed are genuine and important in the lives of most Ugandan teachers. Finally (and this is arguably the most important point), let’s imagine for a minute that Ugandan classrooms are well resourced and schools are well managed, that death and illness are miraculously reduced to what we in the UK see as average, that water and electricity and food supplies are good… as a teacher you’d still want to get paid for going to work. The bottom line in all of this is that teachers in Uganda are paid a pittance. And that’s if they get paid. Sometimes the end of the month rolls around and they are simply not paid. There is little they can do about this. Most teachers take matters into their own hands and take on additional work in order to provide for their families. They drive boda bodas (motorcycle taxis), they farm a small plot of land, they teach part time in a private school whilst also remaining on the government school’s payroll, they run a small business from home, perhaps taking in sewing. This takes them away from their teaching work, but it is the only way to make ends meet. Under these circumstances, labelling teachers as simply being ‘truant’ will only add fuel to the fire. Yes there is a problem of teacher being absence and this needs to be addressed, but not like this. The underlying reasons to why the teachers are absent needs to first be addressed. If you’re interested to read more about education in Uganda, have a read of this article by Anya Whiteside: ‘The state of education in Uganda‘.